100% pure, pitted deglet noor dates are solar dried at a low temperature and ground to a sugar consistency to produce the concentrated sweet, caramel flavor that make dates beloved the world over. Delicious when added to baked goods, date sugar can replace some or all of cane sugar or any other sweetener called for in a recipe. Don't expect them to dissolve in liquid though; they arenÕt soluble like sugar. Instead they contain fiber, which is highly beneficial for your digestion and elimination. Dates have a lower glycemic index than cane sugar due to its fiber slowing down the absorption of its complex carbohyrates in the intestines. If youÕre motivated to cut down on sugar, dates are the perfect way to wean your taste buds off of excessive sweetness. With their potassium and calcium content along with trace minerals, vitamins and free radical-fighting polyphenols, dates are a nutrient-dense food that provide you with more than just sweet pleasure! Phoenix dactylifera. 100% pure deglet noor dates that are dehydrated and ground into a course, free-flowing granular powder. High fiber, excellent source of magnesium, potassium, copper, and selenium along with calcium, iron, phosphorus and B vitamins. Antioxidants from polyphenols. 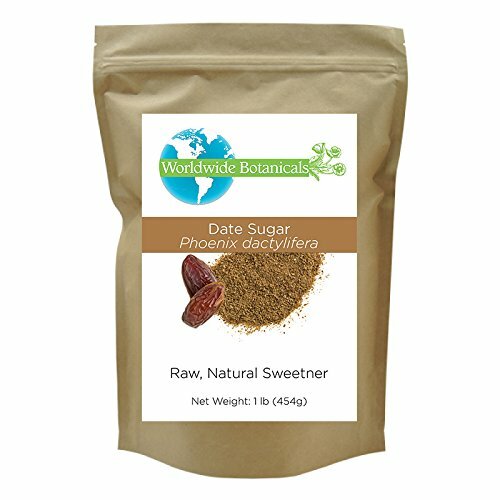 Of all sweeteners except molasses, date sugar has the best free-radical fighting capacity. Use in place of brown sugar to get the most out of its caramel and butterscotch flavor notes in baked goods. Excellent in baked recipes like cakes, cookies, muffins, breads, pies and pie crusts, crumbles and nutrition bars. Replace sugar 1:1. 100% gluten free ~ makes it perfect for paleo and gluten free recipes. Packed in a resealable ziplock pouch for freshness and moisture barrier. If you have any questions about this product by Worldwide Botanicals, contact us by completing and submitting the form below. If you are looking for a specif part number, please include it with your message. The Real Co Organic Raw Cane Sugar, 16 Ounce - 6 per case. Gefen Vanilla Sugar Kosher For Passover 12 oz. Pack of 3.